Why do animals from dogs to humans follow each other's gazes, to look at what other creatures are seeing? Scientists have debated this question for a long time, and at last, we have evidence that it is part of a neurological process that helps us socialize and learn. The best part? Researchers discovered this by playing with Dungeons & Dragons characters. Historically, there were two theories about why humans follow each other's eyes. One is that most terrestrial vertebrates (i.e., land animals with skeletons) have a specific area of the brain that automatically seeks social connection by zeroing in on the center of another creature's face - where eyes are usually located. The other theory is that we have a part of our brains that seeks out the eyes of other creatures, no matter where they are located. In their recent study, published today in Biology Letters, a group of scientists asked subjects to look at pictures on a computer while they tracked eye movements. 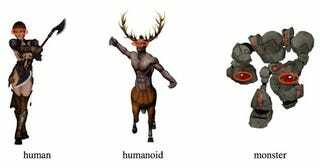 The pictures included "people, non-human creatures with eyes in the middle of their faces (‘humanoids') or creatures with eyes positioned elsewhere (‘monsters')." What they found was that there was a "profound and significant bias" toward looking into the eyes of all three creatures, including monsters. As a result, we have more evidence that the parts of our brains that control our vision system may have evolved to seek out other creatures' eyes as a means of establishing a social connection, or as a way of communicating - even across species. The present study strongly supports the idea that the primate brain is specialized for acquiring social, behaviourally relevant information from others. As gaze selection is the key precursor to gaze following, which is common to both humans and non-human primates, and present in other animals as well, it is reasonable to speculate that this behaviour is subserved by a neural system that is shared within and across species, possibly the phylogenetically old subcortical system that is shared across all terrestrial vertebrates and processes coarse information regarding biological primitives (e.g. prey, predator, conspecific). In primates, the subcortical pathway passes information directly to ‘higher' cortical systems. This information could also prove valuable in treating people with autism, who often have a hard time meeting other peoples' gazes. It was not known whether this was a difficulty in looking at people's faces or into their eyes. This study suggests that people with autism can emulate typical social interactions by training themselves to look at eyes, rather than the centers of people's faces. The pictures you see above are not exactly what the scientists used in their study because copyright concerns prevented them from reproducing images of monsters owned by Wizards of the Coast. Read the full scientific study in Biology Letters.